I'm making calendars for friends this year and had to include this Lil Inker Rowdy Reindeer for a deer-hunting friend of ours. I stamped and die-cut Rowdy and colored him with Copics, then placed him on a Gina Marie Designs die-cut stitched circle. The base is kraft and the dsp is CTMH. I die-cut the "2018" with my Quickutz and added the printed calendar. To add to the fun, here's the back..
Oops! Looks like this one got away! 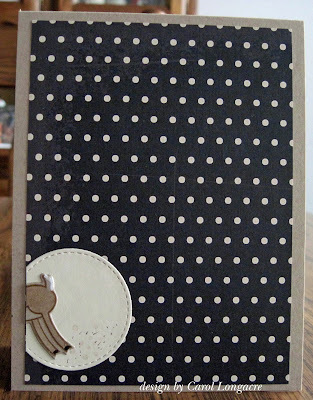 I added some "dust" with a stick stamp by Judith and dotted with a brown marker pen. I'm sharing this with the Cuttlebug Mania "Masculine" challenge as well as the Snippets Playground challenge weeks #307 and 308 , and..... with the Simon Says Stamp Wednesday challenge which is "furry friends." Deer have fur, right? OMG this is such a sweet and thoughtful gift you are making for your friends! And that reindeer is too cute!!! Thank you for joining us at the Masculine challenge at Cuttlebug Mania! A fabulous calendar Carol, such a fun Reindeer - a lovely gift. Fabulous idea Carol, great masculine design too, and I love the surprise element on the back. What a great gift and I love that sweet little deer image. How fun and sure to be so appreciated by your friends. 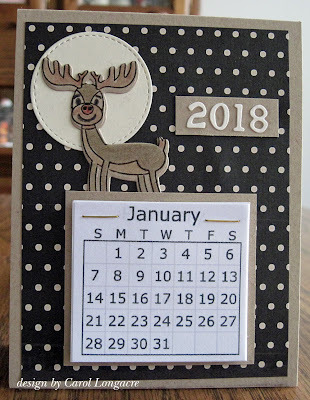 Lovely calendar and as I'm an animalist I'm so happy that the cute reindeer got away LOL :D Very beautiful gift, these mini calendars are a great idea and you make them so well! These are such a great idea! That deer just cracks me up! Love his little tail flag on the back! Ahh this is super cute! Your calendars are so neat/cool! And that little deer makes me smile! This is so adorable! Very nicely done! Adorable calendar! That reindeer is too sweet!! Lovely work!